Apr 21, 2010 By Dr. Kurt Grange, Ph.D., N.D, a nutritional biophysiologist, author and educator. You need “IONICALLY” charged ocean minerals to feed your blood cells; without the “right” hydration and mineral ratio, your blood cells will stop thriving. Good health is your number one concern. Then don’t allow your body to become acidic, or dehydrated; don’t allow your red blood cells lose their natural “IONIC” charge. Dehydrated cells change shape and stick together, clumping in large clots. In this clumpy, sticky state, your red blood cells are starving for water, “ionic” minerals, and oxygen. A well hydrated alkaline pH improves waste elimination and nutritional absorption, two important factors for staying alive and healthy. Using the “right” water helps to hydrate your red blood cells creating an “IONIC “charge. This “IONIC” charge allows them to bounce off each other and repel like tiny magnets, delivering their life energy to the rest of your cells. The “right” pH is the same as the “right” charge, and you can only get that from the “right” water. FACT: Your heart has a 5,000 times stronger electromagnetic field than your brain! It needs the right balance of “IONIC” minerals like magnesium, calcium, potassium, zinc, sodium, etc. Coral minerals have been used for thousands of years as dietary supplements for trace and macro minerals. Coral contains essential bioavailable calcium — plus 73 other essential minerals — and has provided fantastic health results for the founder of Coral LLC and along with thousands of others around the globe, including me. I used these years ago and am happy to have found another great source of this product again for myself and for all of you. 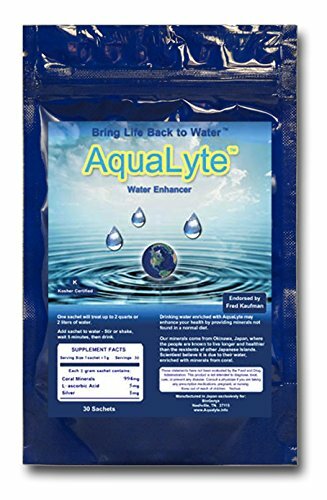 My Favorite:​ When added to water these mineral sachets will: raise the pH of your drinking water or beverage, Buffer chlorine, and add ionic trace minerals to the water. Vitamin C is added as well. As always Coral Calcium is ECO SAFE to assure the consumer that the ocean is never touched when harvesting this product. The structure of the tooth enamel is actually a fine matrix of tubules conveying nutrients from the outside to the inside of the tooth. Brushing your teeth with Coral White whitens teeth and freshens breath. 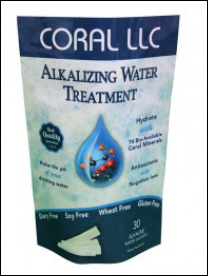 As we lose calcium salts (commonly found in saliva) because of a poor diet, the pH of the mouth can shift to acidic, Coral White (which contains 45% Ionic Coral Minerals) helps to neutralize this pH. With the combination of Hydrogen Peroxide, Tea Tree, Spearmint Oils, Enchinacea, Golden Seal, Cinnamon, Clove, Ginseng, and Ginkgo, Coral White is much more than a toothpaste, it's refreshingly gentle and immaculately clean. Why brush your teeth with a simple toothpaste, when you can brush with Coral White? There has never been a toothpaste made from above the sea fossilized stony coral minerals like Coral White. Try Coral White, you will feel, see and taste the difference. 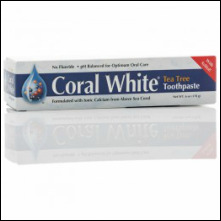 Coral White: World's Only Natural Toothepaste Formulated with Ionic Coral Minerals (calcium) from Above the Sea. Eco Pure Coral consists of 100% pure coral powder (every mineral found in the human body in similar proportions). This powder is identical to that found in the Coral Complex3 blended formula. The coral powder is extremely fine (18 micron, the consistency of talcum powder). So fine that a small amount on the tongue almost absorbs through the mouth. One does not even need to swallow. 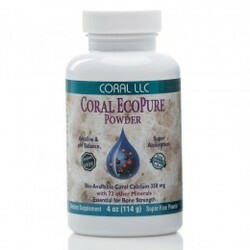 Eco Pure Coral was originally developed for vegans and other purists but has become popular with many people, especially senior citizens and children.... This product contains NO fillers, binders or excipients! Coral Complex in vegetable capsules, now with 900mg of Bio-Available Coral Calcium per serving along with 1200 IU's of Vitamin D3. 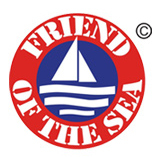 Coral LLC's original encapsulated coral calcium formula and purest. Coral Complex was one of the original (1999) powdered coral capsule in the USA. The formula has become one of the most popular and successful coral capsule formula in the world. The most notable additive is 400 IU of vitamin D3 as cholecalceriferol in each capsule. Vitamin D3, the sunshine vitamin, is necessary to charge the receptors in the small intestine that are instrumental in the uptake of calcium. 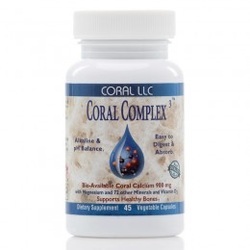 Coral Complex also delivers more than 70 trace mineral which are also essential to the body functions. As always all our Coral Calcium is ECO SAFE to assure the consumer that the ocean is never touched when harvesting this product.